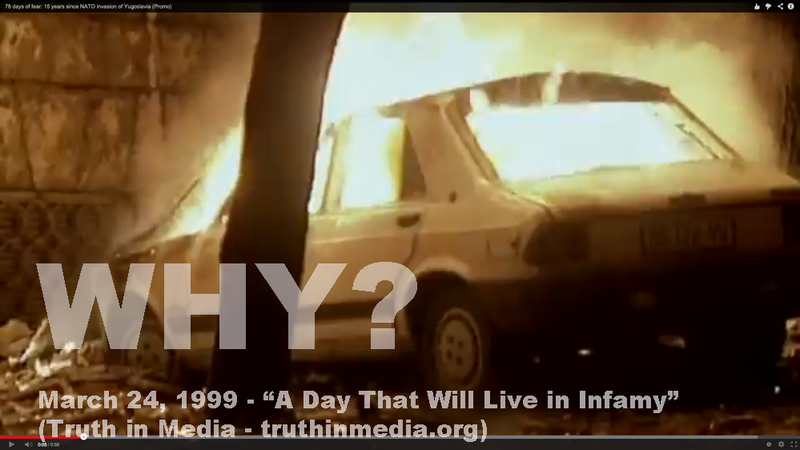 On this day in history: ANOTHER DAY OF INFAMY – TRUTH IN MEDIA: TRUTH TRUMPS POWER EVERY TIME! On March 23, 1999 at 22:17 UTC (2:17 PM PDT), the Secretary General of NATO, Javier Solana, announced he had directed the NATO commander U.S. General Wesley Clark, to “initiate air operations in the Federal Republic of Yugoslavia.” On March 24, 1999 at 19:00 UTC (11 AM PDT), the NATO bombing of Serbia started. And now, here’s the editorial this writer published the morning of March 24, 1999 at the original Truth in Media website. Mark this day – March 24, 1999! It may be remembered in history as a new Day of Infamy. Just as was December 7, 1941, the day the Japanese bombed Pearl Harbor. Except that this time, it is the American-made bombs and pilots that are delivering hell to Serbia on behalf of the forces of Evil. By his order to launch air strikes against Serbia, NATO and President Clinton have entered uncharted territory in mankind’s history. Not even Hitler’s grab of the Sudetenland in the 1930s, which eventually led to WW II, ranks as a comparable travesty. For, there are no American interests whatsoever that the NATO bombing will either help, or protect; only needless risks to which it will expose the American soldiers and assets, not to mention the victims on the ground in Serbia. Bombing Serbia is an act of raw, wanton aggression and violence by a power-hungry Clinton administration. No wonder most Americans who write to us say they are ashamed of it. But shame may quickly turn to blame (of Clinton), if the flames of war in Serbia engulf other nations, possibly even Russia. A military alliance of 19 nations and 780 million people; with over half of the world’s gross economic product, possessing two-thirds of the global military power, ganged up on a tiny nation of 10 million. 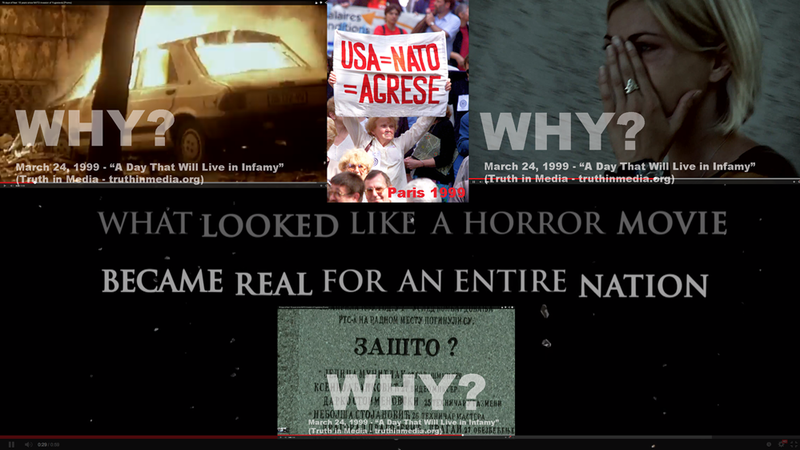 For 78 days, NATO terrorized the people of Serbia, dropping 23,000 bombs and missiles on them in 36,000 sorties. More than 2,000 Serbian civilians and 576 soldiers died in these savage attacks, 79 of them children. Yet the citizens and the army of Serbia remained unbowed and unkowed! This is not hearsay. I saw their defiance with my own eyes during the six days I spent under NATO’s bombardment in April 1999, including a night duty guarding the Brankov Bridge in Belgrade with nothing but their lives. For that reason, I told the Serb people at every stop of my September 1999 “Tour de Serbia”, that it was my privilege to bow my head before them in admiration of their courage and love of freedom. Their exemplary resistance to a foreign aggression against such overwhelming odds inspired millions of patriots across America and around the world. They staged hundreds of protests of their own. 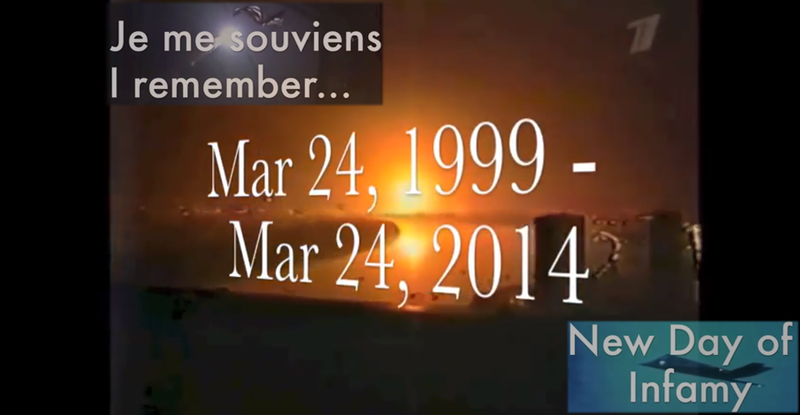 Your presence here on this March 24, 2000, the first anniversary of The New Day of Infamy, also attests to it. And now, I would like to ask you to join me in honoring all NATO victims with a silent prayer or a minute of silence, as befits an ancient nation which has learned to mourn as well as honor its dead. NATO WAR AGAINST SERBIA – 15 YEARS LATER: WHY? Back in the 1990s, I was a war correspondent and geopolitical commentator. My articles about the Balkans wars were published in the Truth in Media and the major media outlets in the US and around the world. March 24, 2014 is the 15th anniversary of the New Day of Infamy. 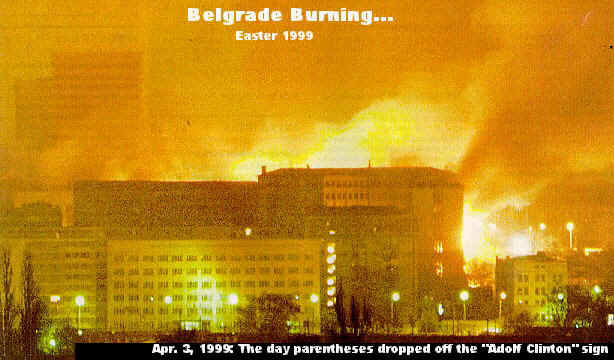 That’s what I called that day in an editorial written on March 24, 1999, just before the NATO bombs started to fall on Serbia. 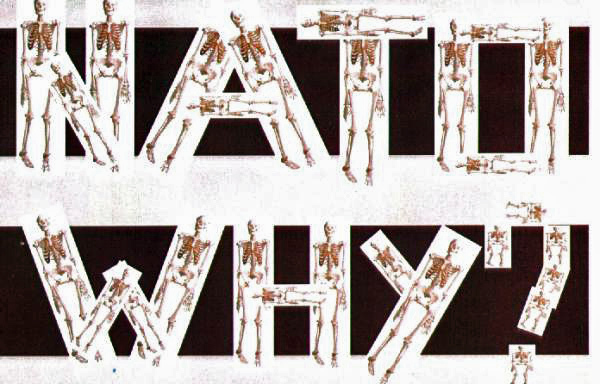 This article and the short film within it are dedicated to the victims of the NATO bombs. They are my memorial to the indomitable human spirit. The music I recorded and used in this video – the theme from “Chariots of Fire” – was chosen by the Spirit for me. Because it also celebrates the strength and indestructibility of the human spirit. There is no expiry date on murder, let alone mass murders. And yet there are war criminals still walking free on American streets. Some have even held high offices in US government. The purpose of this article is to remind ourselves of the fact that we harbor war criminals among us. And not to let them off the hook. Their crimes against innocent civilians have stained the American flag under which they were committed. So we must make sure that we distance ourselves from them if we are to regain the honor and respect that the Stars & Stripes once commanded around the world.